When it comes to SEO searches, your obvious goal is to top the competition and rank higher on local searches than them. 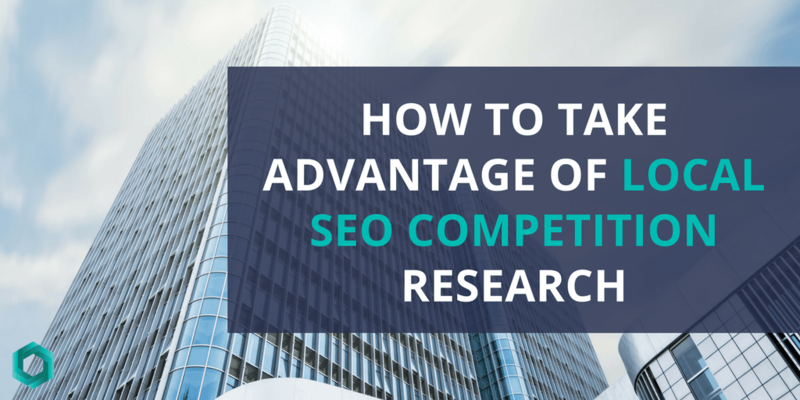 However, this can be tricky to do if you aren’t utilizing the proper resources and doing the necessary research to learn what higher-ranking competition is doing that you are not. Thankfully, there are ways to fix this and boost where you rank when a potential customer searches for services that match yours in their area. You can develop a comprehensive understanding of the market potential customers are responding to. You can get a solid understanding of exactly who your potential customer base is and how you target them more attractively. Implement pre-existing ideas that have been proven to work by your competitors – no need to reinvent the wheel, after all. Finding the right keywords can easily be one of the most important aspects of your SEO campaign. Now, this can be done without focusing on your competition and their keywords, but it can be very helpful to use them as a sort of drawing board. In order to do this, you will need to take some time for keyword strategy and research so you can compile a list of working keywords that will successfully boost your ranking. Attempt to find keywords that aren’t impossibly broad or over saturated with results that will be extremely difficult to top. Once you have decided on the keywords you will be focusing on, you will need to identify who your local competition is. There are a few ways to do this, manually or using a third-party company to run the search. Both work, but the most traditional way is just taking the time to manually enter each of your keywords into various search engines, such as Google and Bing, to discover which businesses come up when you run those searches. Most of the time, you will find many of the same places appearing under different keywords. Make a list of those websites, as they will likely become your most immediate competition. You can also use third-party resources such as SEMrush, SPYFU, or Crunchbase to run a paid search of your top competitors. To get the best results, you can combine manual searches with a third-party tool to help put together a list of 5 – 10 of your adversaries so that you can begin going through each one and mining their data. OK, so what does it *mean* to mine data? Simply put, it is the act of collecting information to help you better understand where you are lacking in comparison to your competition. While it is admittedly easier said than done, it can truly help give you important insight into your search engine rankings and how you can make them more successful. The name of the business. Take note if they have a geographic modifier or keyword stuffer. The address. This should include the city, state, and zip code. Phone numbers. List all the available phone numbers, making note of which is listed as the primary. Landing page URL. This should be URL of the first page you click on. It’s important to note if it redirects to a different URL as well! # of Business Categories. Note how many categories their listing has and compare it to yours. Customer Reviews. Little or no reviews can almost be as bad as negative reviews. Check the positivity of their reviews and make a note to work hard to receive your own. Once you have all this information compiled in one easy-to-access location, you can begin analyzing the data to locate any trends or local SEO strategies that you are not using. Form a hypothesis and put it to the test to measure gains and losses so you can record what works to boost rankings. Since you can’t exactly isolate where exactly you are lacking, comparing them side-by-side can help develop an idea of how you can make improvements. City and state in the meta title. Major keywords in the meta title. H1 details. Is there one? Is the city and state or any major keyword mentioned? GPS coordinates and embedded maps. Compare these to your landing page to identify any patterns and draw hypotheses that can be tested for higher rankings on your site. Create AMPs, or accelerated mobile pages, to cut down on load times. Minimize the number of HTTP requests to lower the server response time. If you are working with a WordPress site, you can try implementing some of these tips to optimize performance and overall speed. Reduce browser caching and emphasize above the fold content. Now it’s time to figure out what links their business is associating with. But how to do this? Copying and paste their NAP (name, address, phone number) in various formats into Google and populating the results. From here you can take a look at what comes up and what websites your competitors are listed on. Most likely, you’ll see their own page, a listing on Yellow Pages or White Pages, social media pages, and similar links on sites that are relative to the industry you are in. This can be tedious, however, so you can use a program like NAP Hunter to help you cut down on the work. Speaking of, you will also need to make a note of the citations, or areas where your competitor’s NAP, appears on outside sites. Remember, quantity is not what while boost rankings, but rather quality. That is to say, it is more important to be cited by websites Google finds authoritative rather than an abundance of citations from poorly ranked sites. You can utilize third-party resources such as local citation finder to help you compare and contrast with your competitors. You should also take the time to learn how to find and build additional citations for your site. Sound like a lot of work? It can be, but once you get the hang of it and learn how to efficiently mine and record data, you can easily compare your sites to your competitors. Check your local SEO rankings often – at least once a month – so you can stay on top of it and be sure to note any fluctuations you see. The goal is to rank as high as possible on SERPs and this can be entirely possible if you implement the right practices and utilize your resources and skills. You can also turn to an SEO management company like Clicc Media Inc to help to take care of all your search engine optimization needs. We offer a number of services to help patients get the assistance they need to boost ranking and deliver conversions. Contact us today at (954) 271-3111 to schedule a consultation with one of our experts!